BACKGROUND: Hydatid disease is a parasitic infection caused by Echinococcus granulosus, and the most frequently affected organ is the liver. The laparoscopic approach to liver echinococcosis represent a last frontier in surgical treatment. CASE REPORT: A 58-year old female patient was admitted in hospital due to jaundice and pain in right upper quadrant. Lab findings show leucocytosis and high bilirubin level. US revealed choledocholithiasis with mild dilatation of intra and extrahepatic bile ducts. US also revealed two cysts in II and III liver segment with suspicion on hydatid disease, one 4 cm in diameter and second 2 cm. Bile stone and sladge were removed by ERCP . ERCP did not show comunication between cysts and bile ducts. MSCT confirm hydatid cysts in II and III liver segment. Serology tests were negative. The patinet recived albendazol during the one month. After albendazol therapy we performed a synchronous laparoscopic cholecistectomy and extirpation of both hydatid cysts. The patient recovered with no postoperative complications. Shortly after she was dismissed from hospital. 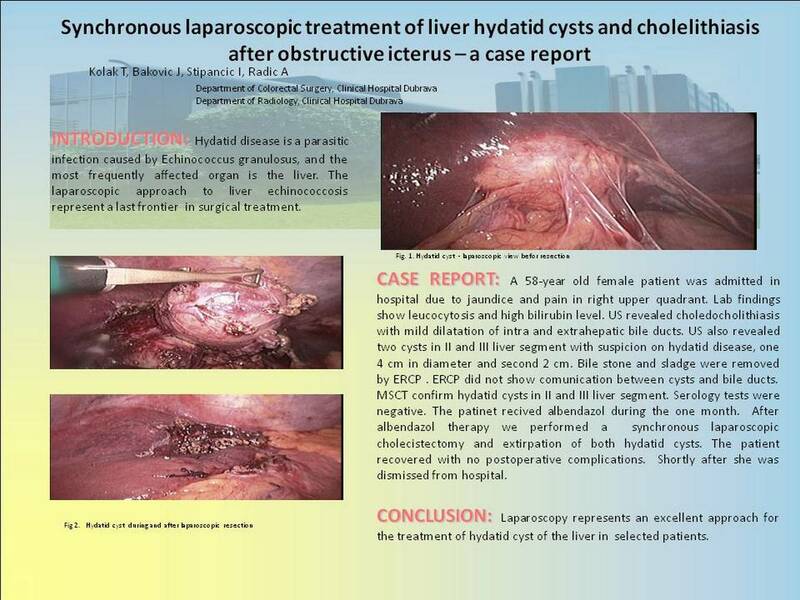 CONCLUSION: Laparoscopy represents an excellent approach for the treatment of hydatid cyst of the liver in selected patients.